Many behavior problems in modern dogs come down to dogs being bored, underexercised, and confined. They spend much of their days indoors. When they’re outside, they’re rarely allowed to sniff, dig, run, and jump to their heart’s delight. Introducing your dog to nosework can make your dog’s life better. The best part? You don’t even have to go outside. You literally don’t even have to put your shoes on to get the impulse control, exercise, and soothing benefits of nosework. Barley and I went to our first nosework class practically by accident (and at the urging of the Denver dog training masters at Canis Major Dog Training). I had a high-energy, brand new border collie on my hands and I was ready to dive into the world of competitive dog sports. The closest and most convenient class was for nosework. Intrigued, I signed up. Now, Barley and I practice his nosework skills almost every day. It soothes him when he’s stressed, distracts him when I’m busy, and exhausts him when I’m sick. It’s kind of a miracle cure. All we need is a few pieces of meat – we generally use ground turkey or boiled chicken. We can practice nosework in a bedroom, in an apartment, and even outside. If you’re interested in getting help with your dog’s nosework, book a class with me! I’ll help you personalize a nosework training plan and move your dog along. Nosework is perfect for dogs with behavior issues or special needs. Many, if not most, modern dogs just aren’t getting enough of the right kind of exercise. They might sprint dead-out after a ball for a while, go to the canine equivalent of a rave at a dog park, hang in the backyard, or go for some constrained walks around your neighborhood. But there’s a good chance your dog rarely gets to use his nose to solve cognitive problems. That’s where nosework comes in. Nosework helps your dog relax. The science gets technical fast, but sniffing is soothing for dogs. Blood flow to certain areas of the brain increases when your dog is sniffing really hard, and this can help calm your dog down. Nosework teaches your dog how to problem solve. Many dogs never get much of a chance to “figure it out.” Nosework allows your dog to use his nose to solve problems to find food. This is how most canids spend hours every day! Nosework is exhausting. Got a naughty dog? 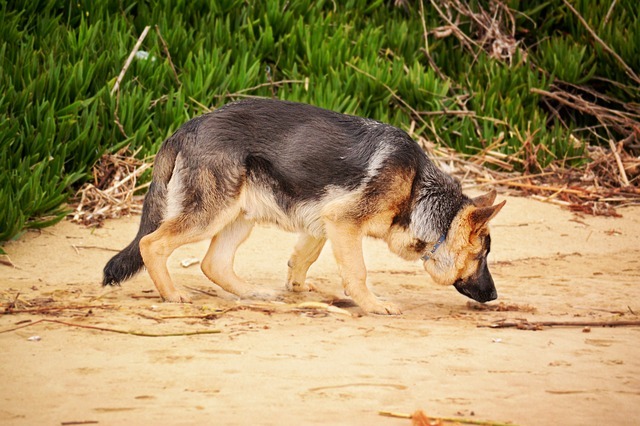 Rather than constantly amping him up with more and more exercise (like fetch), try nosework. Problem-solving is exhausting (remember how you felt after the SAT, ACT, or a big day at work?). Pair that with the soothing effects of sniffing, and nosework is one of the most powerful tools out there for soothing a hyperactive dog. All dogs can do nosework. Even if your dog is blind, deaf, three-legged, or all three, she can do nosework. This is great for dogs with hip issues, older dogs, or shy dogs. Aggressive dogs can also get great exercise without putting others at risk! Now that you’re sold on the many benefits of nosework, it’s time to get started. Nosework should be fun and relatively easy. Think of it like teaching your child what numbers are, then how to count, then how to add, and before you know it they’re working out calculus. Don’t start off too strong, and spend time mastering the basics. Here’s a basic progression for how to teach your dog nosework. Step 1: Teach your dog what the game is. Put your dog away for a moment. Then lay out 3-10 containers in a line. You can use shoeboxes, Amazon boxes, bowls, Tupperware, or any other containers you’ve got handy. Cardboard boxes are ideal. Now put a piece of smelly meat into each container. I use boiled chicken or turkey. Use real meat here – training treats often aren’t very strong-smelling. Let your dog into the room and let him investigate, finding the treats as he goes. Every time he finds a treat, give him a second one right where the first one was. This helps teach your dog to wait for you when he finds something because he’ll get paid double if he does! Repeat until he makes a beeline to investigate boxes every time you let him into the room. Then slowly start to put treats into only 3/4 of the boxes, then 1/2, then 1/4. Your goal is to have about 1-4 hidden treats per search round. Hear all that sniffing? That’s your dog’s nose working. Remember that each sniff is helping your dog relax, learn, and problem-solve. How cool is that? Trainer’s tip: let your dog lead you. Just follow him at a bit of a distance. If he doesn’t find all the treats, that’s ok. Just wait for a while. You can always just end the session with a treat or two still in the boxes. No biggie! Step 2: Complicate matters a bit. Putting the boxes in a circle. Setting up the boxes in rows. Putting the boxes along walls. Tucking the boxes along the wall near the entryway. For now, keep all of the boxes on the ground and don’t put them under things. Trainer’s tip: Contact me as always, if your dog is really struggling somewhere, take a break. If your problem is too hard for your dog, it’s time to go back a half step until he’s more confident and successful. if you’re getting really stuck. Step 4: Adding vertical complexity. Putting treats in boxes over or under a table. Hiding treats in boxes over or under a low stool. Putting treats in boxes inside a fully open large cabinet (at or below nose level for your dog). Hiding treats in boxes behind a grate, like a baby gate or ex pen. Putting treats in boxes on the other side of a couch. Put the treats in boxes inside of open drawers. Now your dog is comfortable with some obstacles, it’s time to hit the road with your nosework skills! Trainer’s tip: if your dog likes toys better than treats, you can start to use tug of war or a ball toss as your reward instead of an extra treat. Regardless, keep rewarding your dog with something “extra” when she finds the treat! Step 5: Try new rooms. It’s time to start experimenting with your nosework games in different rooms around the house. Don’t go outside just yet. 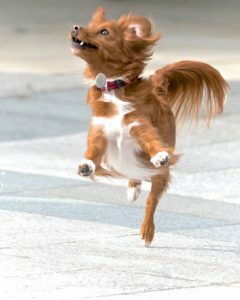 The wind outside can be really difficult for dogs! Instead, start experimenting with playing nosework games in different rooms. You might want to use multiple rooms for the search if your house is small. You can also try playing nosework games in quiet hallways, enclosed parking garages, and friend’s houses. 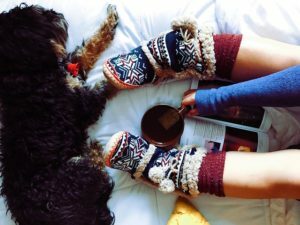 When your dog is doing really well with this, you can try putting boxes on a small back porch, balcony, or another outdoor area on a calm day. Don’t add too much wind too quickly, or you might discourage your dog! Step 6: Out of box hides. It’s time to start weaning your dog off of boxes. 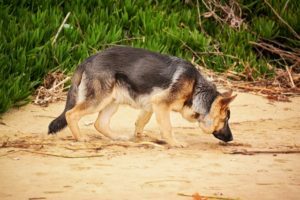 You’ll always go back to the basics when you make the nosework game harder for your dog, but taking your dog’s treats out of boxes will help take the game up a notch. To start, place treats near boxes but close by. Your boxes can still be a visual cue for your dog to search that area. Gradually, you can reduce the number of boxes as you go along. Trainer’s tip: now is a good time to introduce a “search cue.” Before you let your dog start to play the nosework game, just say the word “search” and then release him. This word will become the cue to start searching for food! Step 7: Repeat steps 2-6. Now that your dog is working with treats hidden outside of boxes, it’s time to go back to step 2 and start again. This time, your treats will just be outside of boxes. It’s important to go back again each time you up the ante on your pup. You might be able to progress more quickly through each step than last time! By now, your dog is probably a nosework pro. He’s really excited to get started. He just loves the game. That’s great! Start playing nosework games with toys and other exciting things lying around, and reward your dog extra-well when he finds the right treat. This will help build focus. You can even start working with low-value food rewards out to distract your dog but only do this when your dog is really focused on the game. Use less-enticing treats like carrots at first, and don’t build too fast. If your dog is searching while on a leash, you can gently prevent her from eating distractions by not giving her slack to move towards the distraction. Step 9: Pairing a scent. This step is optional! You can keep practicing nosework without ever adding an extra scent. However, adding in an extra scent is a fun challenge for dogs and trainers. You can purchase a nosework scent kit online, or just purchase a few travel shampoo containers and poke holes in them. Then you can spritz a few Q-tips with your chosen scent or dip them. Essential oils are a great option. In competitive nosework, they generally start with birch oil. It doesn’t have to be much! Don’t be surprised if you can barely smell the Q-tips. I’ve used both birch oil and peanuts as Barley’s target scent. Don’t be afraid of getting creative, but do keep the scent consistent. If you start to teach your dog to sniff out birch oil, stick with birch oil until your dog is very good at it! Now, go back to step 1. Only now, instead of just having a treat in a box, you’ll have a treat on top of your new scent container. This is where it’s extra important to feed your dog when he finds the hidden treat and scent container! Gradually decrease the size of the treat on top of the scent container. Your dog will slowly start to use the scent container as a cue to find the treat, rather than the scent of the treat. Do some very, very easy trials where there is no treat on top of your scent container. If your dog’s nose hits the scent container, reward him immediately. Repeat this several times until your dog seems confident. Step 10: Repeat steps 2-8. Now that your dog is searching for your scent container instead of food, you can repeat the whole process! You can do this as many times as you like to teach your dog to find all sorts of different scents. Keep in mind that this is different from how tracking dogs find a missing person. However, this is very similar to how drug dogs are trained to find hidden stores of drugs. If you’re interested in getting help with your dog’s nosework, book a class with me! I’ll help you personalize a nosework training plan and move your dog along. Pingback: Help! 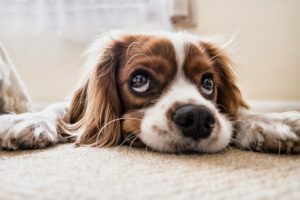 How do I Stop My Dog From Crying In The Crate? 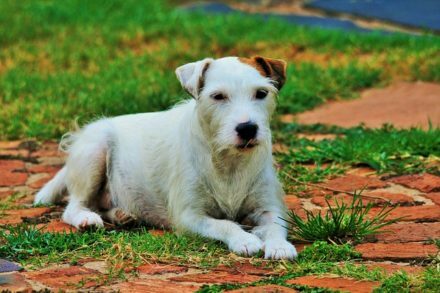 Pingback: How to Socialize An Adult Aggressive Dog: It's Not Too Late! I too am an up and coming trainer, however I am just starting out. I am currently enrolled in Animal Behavior College and am gearing up to finish and receive my certification from them as a dog trainer. After reading your blogs, I find that you have a gift of converting training directions, into very easy to understand explanations. Thank you for writing your blogs and your website. I actually viewed a trainer conduct sent work training during my class and it was quite insightful, but what he did not mention was the part about calming the pup. I recently adopted my project dog from the shelter we work at as a class. She has a very high prey drive and when she gets excited (which is not hard) she mounts. I never thought of using this to assist her in working through her quirks. But I will try after reading this article. Thanks again. Hi Angelica, that’s so cool that you’re going to give this a shot. Scentwork is SO cool, especially for those excitable dogs. They often not only do really well at it, but it helps them calm down elsewhere. Let me know how it goes!